The home of M.V. Invincible, the largest of all the Orkney dive boat fleet. 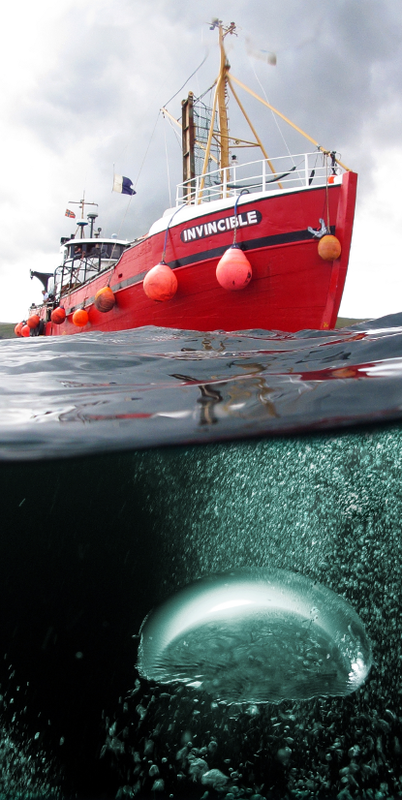 The Invincible takes divers to explore the many wrecks at Scapa Flow. Whether you enjoy wreck diving, drift or scenic diving. For the keen photographer, there are stunning photos to be taken of the wrecks and of the sea life both above and below the water. Scapa Flow is situated on the north east coast of Scotland. It is a large expanse of water surrounded by the Orkney Isles. It is a natural harbour providing shelter from the worst of the weather. It has been used as an anchorage since Viking times, and through both world wars. Scapa Flow is one of Europe’s premier wreck diving centres, the historic site of the scuttled German High Seas Fleet, where you’ll find seven large warships and four destroyers remains, which still lay waiting for you to come and explore on the sea bed. M.V. Invincible has an overall length of 25m which provides an extremely safe stable platform for scuba diving; she is a fully equipped liveaboard, including a diver’s lift, operating out of Stromness Harbour. At Scapa Flow on the M.V. Invincible we can accommodate all levels of divers from a PADI beginner, seasoned BSAC veteran or advanced IANTD Technical, we cater for all your needs so whether your a single cylinder, air diver, Nitrox/Trimix, twinset, sidemounts or even mixed gas rebreathers. We're your one stop shop, with facilities for individual divers, or group bookings for up to 12 divers all catered for to the very highest standards.